As we’ve talked about a little here on the blog and on Menage A Tarot podcast, I’ve had an adventure in deck exploration over the past several months. And it has been nothing but good. First it has been an experience of gratitude – I’m so thankful to have enough readings come in that I could get a couple of new decks. Thank you all. Second, it has been an experience of learning. In martial arts, there is a largely unspoken ethos of lifelong learning. A teacher, knowing their realm of expertise, will sometimes send a student to another master instructor if the student needs a skill and the first teacher either doesn’t have it or the other teacher is much more expert. We all always learn. At some point, we shift from learning from a teacher to learning from self-study and teaching…but they are lessons just the same. The same is very true in Tarot, except that typically the learning from a teacher part is much more abbreviated and very often the lessons come in book rather than Socratic form. But that is learning just the same. From what I’ve seen, all the best Tarot readers are also avid book readers, and perpetual learners, one way or another – either learning from others or learning from the teaching / creative process. Third, working with multiple decks over time reinforces how valuable it is to have the right tool for the right job. A master craftsman could build a bookshelf with nothing more than wood, saw, nails and hammer. But with a few more tools and materials on hand, they could make that bookshelf into an heirloom work of art. I know. I spent hours as a kid watching my Grandfather do just that. Never thought I’d get to do the same thing with bits of paper. Most important, I think, is the notion of parallax. Even as rich and complex as the Tarot deck inherently is – no one deck can be all things to everyone. It takes to eyes to perceive depth and spacial relationships. It takes many people to add to our understanding of life, spirituality and human nature. If one deck (reader, author) doesn’t quite nail the message that is needed, another might. Put two together, and you see farther and deeper than before. Put multiple views together and you get the value and facets of a beautiful diamond. The 5 of Cups is a good example. The RWS artwork plus the “painful loss” interpretation by Diane Morgan makes this card a bit harsh, acutely painful in its connotations. It works. It gives a perfectly serviceable way of dealing with this card. But it was one of those cards that for no tangible reason feels a half-bubble off. Maybe its my word-nerd tendencies showing, but that particular combination of words and image lack a certain elegance. It has a ham-fisted feel that just doesn’t quite capture the right connotations and denotations for the message. It feels dire, like being stabbed with a knife. This particular combination feels large and permanent, very akin to the major arcana cards of the same ilk. This particular combination feels bigger compared to other numbered minor arcana cards. Then along comes the decks I never would have thought to buy six months ago. My metaphorical Tarot bookshelf-building advanced a long time ago, but I never took a notion to expand my toolkit. I just didn’t want blow the money, quite frankly, because of the screaming tight budget and low overhead I try to keep with readings. I want my readings to be an affordable resource for everyone, not a luxury entertainment for a few. But in any case: both the Tarot Illuminati (my new special occasions, probably just for personal use deck) and the Witches Tarot (my new working deck…I really like spending time with this one) have that “Goldilocks” just right blend of look, feel and words for this card. 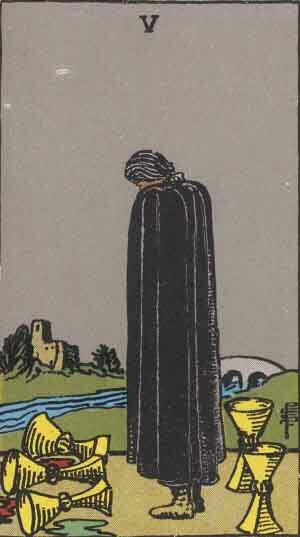 The image from the Tarot Illuminati deck is strikingly similar to the RWS deck (cloaked man looking away, five empty cups strewn around and knocked over) except that water is the majority of the environment, not a little trickle through the middle. Both The Witches Tarot and Tarot Illuminati have a softer, more wistful, bittersweet feel. Yes, the idea of painful loss is very much still there, still “right”…but the connotation is just that little bit different. There is a temporary melancholy, not the dire warnings of the devil, or the permanent changes of the death card. There is a sense of acceptance in this card that was missing in the RWS version. There is a sense of acknowledging the loss, but also of the feelings that go hand in hand with significant losses. Not every emotion has to be comfortable. Not every moment in life is joy. Losses happen, and the emotions that come with them are to be respected, to be felt, to be accepted as the normal, natural part of the human experience that they are. Rains must fall, or we all die from lack of water. Still, “it can’t rain all the time” as the line from the movie “The Crow” goes. This card reflects the normal, natural and inevitable losses in life, and the normal, natural and inevitable – but temporary – emotions that go with them. So it would seem that third time is lucky for the 5 of cups. It took three decks to get here, but it would seems the 5 of cups has made its voice heard. Bringing in the other decks brings the right tools to the job.